You're all ready to report for duty. You have taken the time to iron your uniform in order to make sure you look presentable. You've guzzled down your morning coffee, so your kidneys are up and at em. The car keys are in your hand. What is missing from this picture? 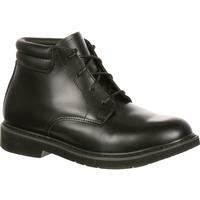 The Rocky Polishable Dress Leather Oxford shoe of course. The upper of the #511-8 oxford is made with genuine leather and can take a nice spit-shine (like its companion chukka). So not only will your oxford have the look and feel of quality materials, but you'll be able to preserve a spick-and-span appearance. You will be delighted to know that Goodyear welt construction was used during the creation of this oxford (along with a storm welt). This was done in order to give your shoe durability, shape-retention, and a solid platform that will keep your feet comfortable even after you have been standing for hours. In order for the #511-8 oxfords to maintain their long lasting shape retention, chemically activated sheets have been placed in the toe box and heel counter. Your Rocky dress leather oxfords will remain a great fitting shoe because of this process. 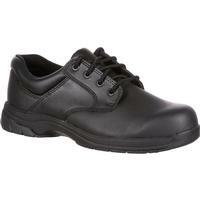 If you are looking for a duty shoe that is going to be comfortable, one of the features that will stand out for you is removable PU (PolyUrethane) footbed. 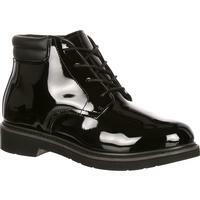 Why will this make such an impact on your overall experience wearing the Rocky duty oxford? Good question! The footbed was created with an outstanding compression-set. What that means is that your duty oxford will remain intact and be able to reliably return to its original shape even after you put it through multiple pressure applications. To provide your feet with even more comfort - and really who wouldn't want that- the PRO-CELL footbed was created with an extra-large integrated energy return heel plug. The PRO-CELL blown rubber outsole, on the #511-8 oxford, is made with a traditional 90 ° angle on the front of the heel. The #511-8 duty dress oxford is crafted on a classic, round toe navy last. This look was first adopted by the US Navy for sailors' shoes that had to fit well and comfortably, so you know you are going to love this quality of your oxford shoe. 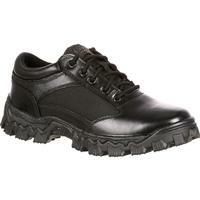 For support, the #511-8 also features a non-metallic stabilizer. Sometimes if you have a medium, wide, or extra wide foot, it can a challenge to get a shoe to fit you properly. This won't be a problem with the #511-8 oxford. To give you an even better fit, several options are available in terms of width. 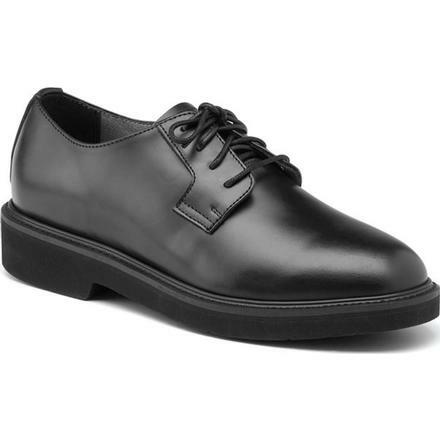 The Rocky Polishable Dress Leather Oxford is a first-rate choice for you if you are looking for a quality dress duty shoe, which will leave you and your feet feeling contented during those long shifts.